Happy Valentine's Day! I hope you all have a day filled with love and happy memories. Just sharing a another snow pic - so tired of snow. It was pretty while it lasted, but I'd much prefer sunshine. :) The littles, and the pooch, had to go out and play in it for a bit. We had gorgeous, great big flakes that accumulated to about 2 inches, and then the rains came…and haven't left. Wishing you all sunshine and warmth for the weekend - if not from Mother Nature then from those you hold dear. oh I am hoping some snow melts around here this weekend! I love how you're able to capture the big flakes falling... the overall effect is just magical. Great shot! Have a warm and fun weekend!! Happy day my friend!!! Hope it's great! Our dog goes nuts in the snow too - it's so cute. Still working on the hubs to let me get a dane :) maybe a harlequin. That is one happy dog! Still snowing a little bit here… and my dog is also thrilled with the joy of it! Hope you all had fun with the white stuff..ready for Spring here! Two days ago the ground was blanketed. Today it's sunny and grass is turning green. WEIRD! I want more snow! Your photo is lovely. Happy Valentine's Day my darling friend! Well I must I found this snow photo quite fascinating. 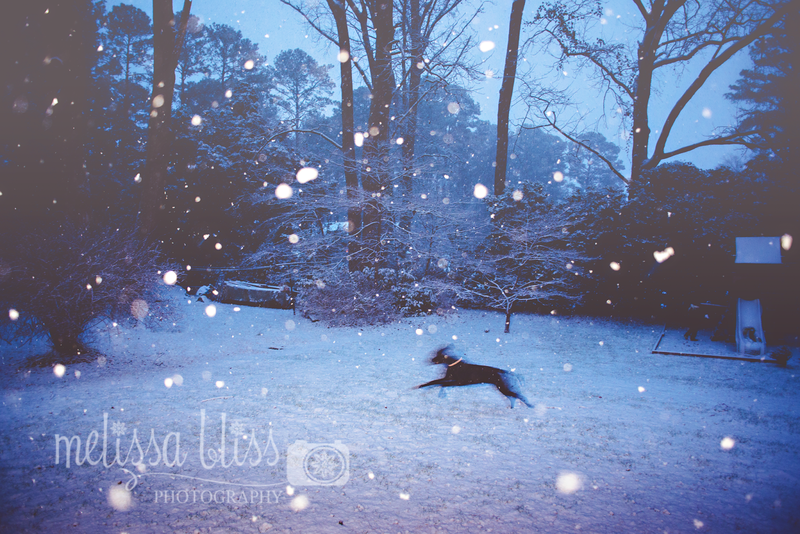 I love the motion of the dog and the fact you can see the flakes falling around him.